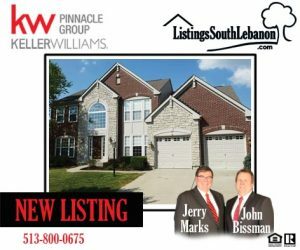 Open House is Stone Brook Sunday Oct. 23 12-1:30pm – 5255 Red Flower Lane, South Lebanon, Ohio – Priced to sell! Come see this gorgeous home located in Stone Brook Subdivsion! It features a beautiful open floor plan with 4 bedrooms and 2.5 baths and a bonus room that could be a 5th bedroom. It also has a full unfinished basement just waiting for your finishing touch. Also has a large patio in the backyard! Move in ready! Priced to sell!